Here are a few pictures of the breakfast we had at the church yesterday. Underneath the flowers is one of the placecards i had made for each of the ladies. After the meeting, i got to keep the flowers! Posted by the Chacogirl at 10:42 a.m. This morning we had a ladies tea at our village church. Two friends and I had prepared all of the food. It was a lot of work, but we had a lot of fun. My sister came and talked to us about reading the bible and getting to know God more personally. I was blessed by this and I think a lot of the other ladies too. I'll post some pictures tomorrow, with the table deco and stuff. 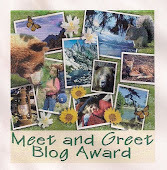 Posted by the Chacogirl at 6:14 p.m.
Hi, i just found this picture from the craft show 2 years ago, because i was thinking of a contest in polyvore. Teddy bears picnic, it's called. I made this miniature wall quilt for my sister a few years ago. It came from an Australian magazine my oldest sister in Canada sent us. Not weather for a picnic here, 10 C and drizzling. My favorite weather, have a cup of cappuccino with me? Today i'm back to baking again. 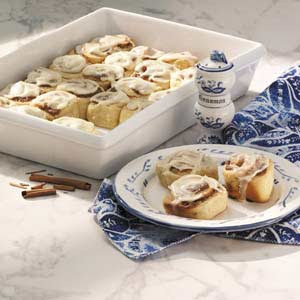 I need to make some cinnamon rolls for a ladies breakfast next week. I'm making my "famous" lemon supreme pie and i was going to make caramel popcorn, both to take to a family gathering tomorrow. Hope i get it all done!!! I found this following picture, and love it. 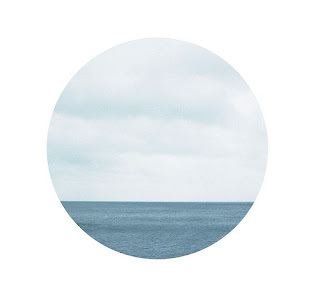 This peaceful image is how i want to feel. 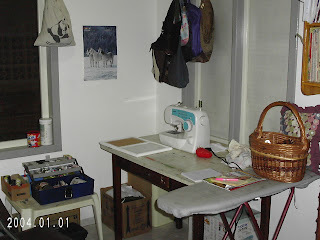 Posted by the Chacogirl at 8:14 a.m.
My craft and sewing room! Posted by the Chacogirl at 5:31 p.m. 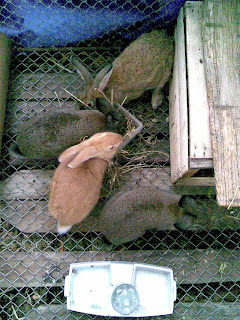 Feeding time at our "zoo". 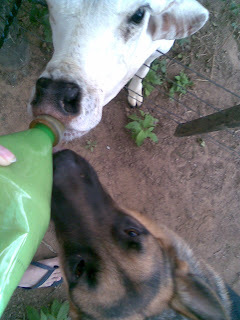 One of my morning duties is feeding all our pets. 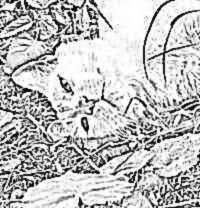 I start with Milka, the calf, then the chickens (i don't know all their names, but the kids named all 4 ladies) the rooster, Caruso, the 5 rabbits (Caramela, BlackJack, Honey, Lucky and Domino), the dog, Chester, the parrot, Niko, and last but not at all least the cat, Eskimo. Just look at those happy rabbits! Posted by the Chacogirl at 8:58 a.m. Yesterday morning Cindy was playing with Chester before school. I'll see if i can put a video clip of it on here! 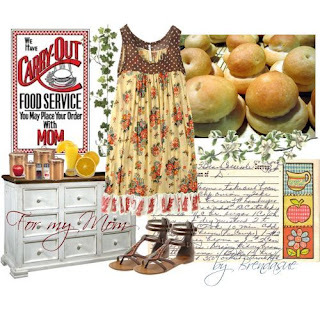 Posted by the Chacogirl at 8:43 a.m.
A polyvore set for a contest: Cooking with Mom. 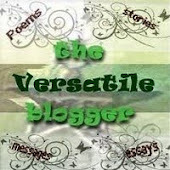 Also entered it in contest: Precious People and won 7th place. Just took this picture. 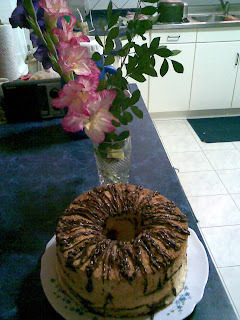 It's a Marble Chiffon Cake I made for a family gathering tonight at our house. I got the flowers this morni ng in church! Posted by the Chacogirl at 3:52 p.m. I like to give meaningful gifts. I have an eye for design and pattern. 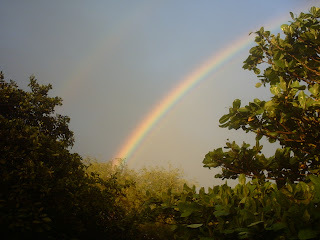 Posted by the Chacogirl at 1:58 p.m.
We finally had some rain last night! It sounded so good on the roof while falling asleep. We got almost 40 mm. Filled the cistern part ways and filled out hearts with hope for some more before winter starts! Posted by the Chacogirl at 12:32 p.m. I was sitting at the sewing machine almost all day today. 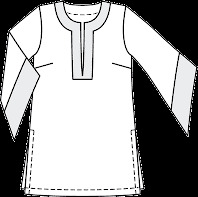 I started to sew a tunic/blouse last week and needed some contrasting material for a trim around the collar and sleeves. Finally got some yesterday, and also found some beads to sew around the collar. 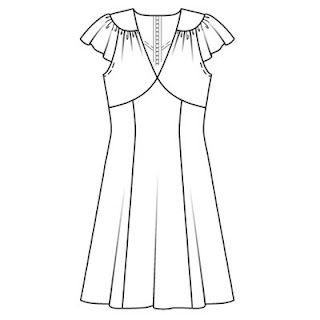 Then I started on a dress. I actually wanted to have it done for myself as a Mother's Day present (from me to me) but it probably won't be done by Sunday. It's in a beautiful dusky rose color, and i hope it turns out good. This is a sad year for us. We plant sesame and peanuts after the first rains in November/December (spring in South America). But the spring rains weren't as big as they should have been. We waited until February with some planting, but didn't get any real rain. The sesame harvest was poor. Last year it took us over a week to harvest the sesame, this year we had it done in 3/4 of a day. 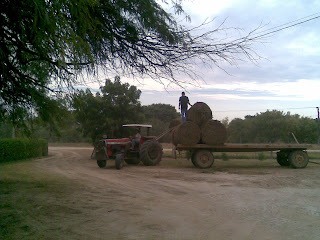 The peanut plants have dried up and died, so we did the only thing we could, plowed them out and made bales out of them. 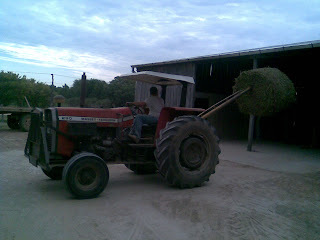 The bales will be very useful in the coming winter, because there is almost no pasture for our cattle. We are not alone in this, the whole paraguayan chaco is dry and suffering. Please pray for some good hard rain before the "dry" season of winter arrives. On Saturday, the 9 of May, there will be a big prayer meeting in the close by town of Filadelfia. Please think of us and the poor cattle and nature around us drying up. Sorry to be so down today. 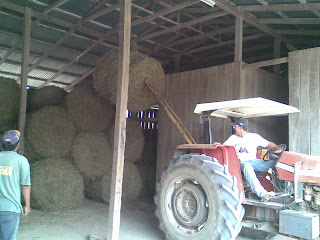 The following pictures show my husband putting the peanut bales into our barn. 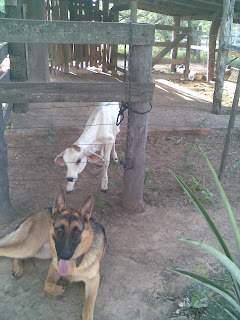 Posted by the Chacogirl at 12:22 p.m.
Chester, our german shepherd dog, loves Milka, too. 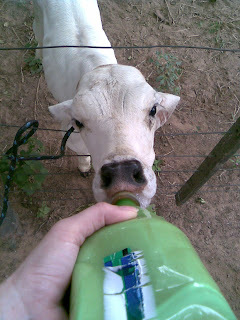 He would try to lick a few drops of slobbery milk dripping out of Milka's mouth. Posted by the Chacogirl at 8:13 a.m.
Posted by the Chacogirl at 8:00 a.m.
Today is Saturday. Baking day! I had to bake a cake today to take to the bake sale tomorrow at church in town. I baked a 5 layer "Blaettertorte", which is a cake that consists of 5 layers of baked cookie-like wafers and chocolate pudding between each layer. Later on today I'll frost the sides and top with whipped cream. I'd love to post a picture of the cake, but as i only have my trusty Nokia 6300 to take pictures, the quality of indoor pictures is minimal. 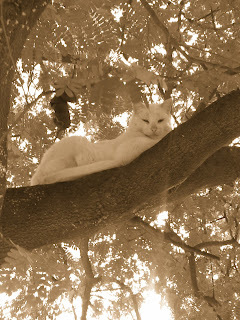 So I'll post some pictures of my beloved old cat Eskimo in his favorite pastime: sleeping in a tree, and some others! Have a great weekend! Posted by the Chacogirl at 1:33 p.m. I'm really new at this, but if anyone is interested in the life of a seamstress-farmer's wife-mother of three daughters, etc. just come and take a look. A little bit about me: I'm thirty-something (can't remember exactly how much), I've been married for 15 years to a peanut farmer/rancher. We live in the Paraguayan Chaco with our three daughters. I love to craft and sewing is my passion. 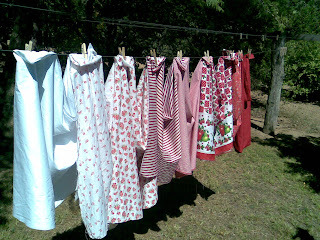 I sew clothing for myself and family and love to make patchwork quilts and bags. 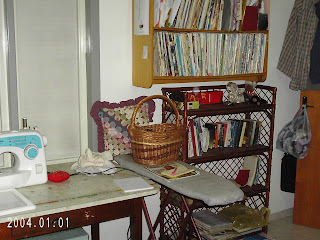 After my sewing room, the kitchen is my favorite place in the house. Cooking and baking for my family or for entertaining friends is also one of my hobbies. I work actively in two ladies groups from church and love doing it. I'm also in the crafting committee in our town, that hosts and organises a large craft show every two years. Posted by the Chacogirl at 8:38 p.m.